"Ideal for dry, cracked, dehydrated, and stressed skin, this intensely hydrating vitamin B5 masque is essential to restoring the skin’s optimal moisture balance by combining naturally occurring humectants to bind moisture, and to improve form and function of the skin. 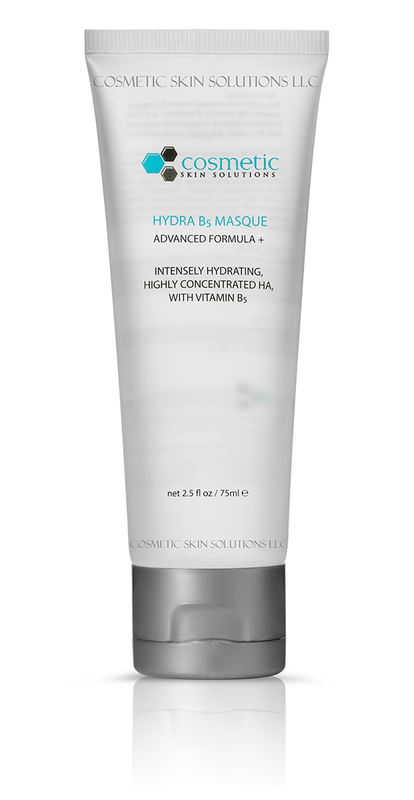 This highly concentrated vitamin B5 masque supplies high amounts of hyaluronic acid (1%) to replenish depleted moisture levels associated with skin conditions listed. Hyaluronic acid is the skin’s natural moisturizing factor (NMF) responsible for tissue hydration and immediate water attracting and binding attributes. Ideal for all skin types." Now for those who have no clue what hyaluronic acid is, allow me to elaborate. Hyaluronic Acid (HA) is found naturally in the human body and seen in high dosages in babies. Ever wondered why babies and small children always look like they have beautiful supple plumpy skin? Well its because of the hyaluronic acid in their system. Its a major component of skin tissue that give babies this beautiful effect. Skin in general holds about fifty percent of your body’s hyaluronic acid in it. However as we get older we loss a lot of it and thus aging takes it toll. 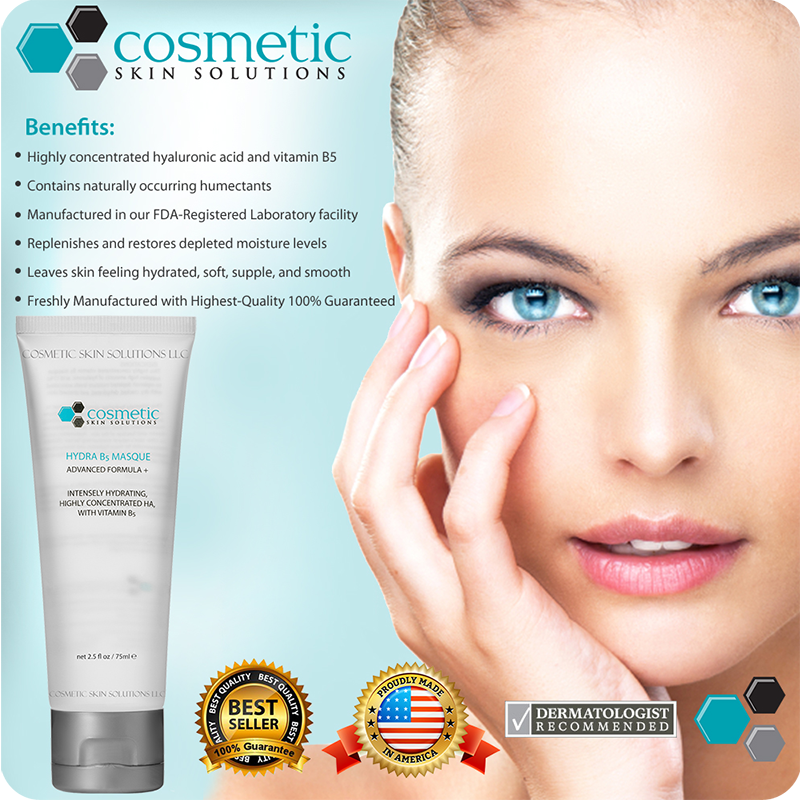 Hyaluronic Acid plumps and moisturizes skin as well as it helps to heal and comfort it when its suffered damage. Hyaluronic Acid also prevent fine lines and wrinkles from forming and helps by retaining moisture in the skin and creating a cushion like effect to help plump out the lines as we age. So once I realized that it has HA in it, I decided to order it. I recently have been dealing with a skin rash that broke out on my face and all over my neck for over a month now. No one knows what caused it or why it won't leave. When I finally got myself over to the doctor (one month later) I realized that the rash left me with dry skin on my face and it was pretty bad. I was actually bleeding in certain parts of my face. I used my Clarisonic as often as I could to buff away the dry skin cells but nothing worked. I then used my Argan oil and Passionfruit oil (Maracuja) but still the dryness would not leave. I starting using once a week a dead sea mud mask (click here for that review) that helped with the dryness, however you could only apply once a week and you had to wash it off after 10-15 minutes. I started shopping around for a face cream/masque that would help with this issue at night. However everything kept coming up short or whatever I did try made it worse. So when I saw that CSS came out with this product, I decided to investigate the ingredients and give it a shot. I mean the rash literally left me looking like I had suffered burns to my face and neck, so really how much worse could it get. The product arrived to my house on Tuesday. When bedtime came, though I will admit I was scared as all high hell to try anything new at this point, I gave it a shot. I have used CSS and they have NEVER let me down so I went for it. So far I have used this product two nights in a row and OMG what a difference!! I was amazed as to what my face felt like when I woke up the next morning. It was literally so soft that I could not stop touching it! My skin felt supple, plumpy and ever so soft. It literally looked hydrated. I haven't been able to wear makeup because of this rash, yet my skin looks amazing without any on at the moment. This masque has literally made a massive difference on my face. It didn't cause further irritant or dryness and basically just worked with my facially issues at the moment. Another reason why I love this product so much is because it has NO fragrance dyes or perfume in it. All that stuff really messes with your skin. Its a clear gel like consistency that goes on super smooth and leaves no film or sticky feeling behind. All you need is one small squirt as it really goes along way. Since it is a gel like based it spreads very well with very little needed. I honestly am in love. I just adore CSS because of the amazing products they put out. Plus they ship to Canada which is fabulous and a must need for the cold harsh weather in the winter. They are very similar to the company skinceuticals. However CSS has way better pricing that is more reasonable which is what keeps me coming back. They have great products, affordable pricing and package quality. If you need extra moisture for your skin, this is it and truly worth the dollar value without all the unnecessary bells and whistles aka facial irritants that you find in other products!